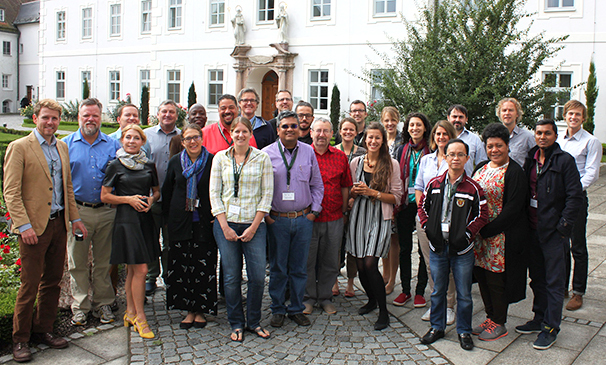 ‘Enhancing Resilience to Minimise Loss and Damage’ was the theme of the fourth Resilience Academy, held over the first week of September on the island of Frauenchiemsee, on Lake Chiemsee in southern Germany. Organised by the Munich Re Foundation, UNU-EHS and the Internal Centre for Climate Change and Development (ICCCAD), the week-long retreat featured a series of presentations, discussions, writing sessions, film screenings and mini workshops. Alongside these, participants were encouraged to establish new collaborations and build on existing networks, and to work on group papers. 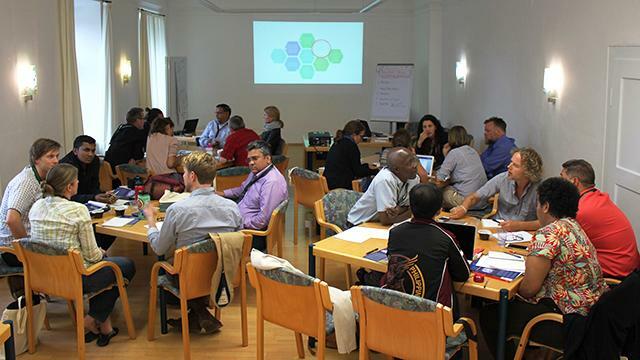 The 2015 Resilience Academy, the third such initiative, was held in Bangladesh, with the focus then on bringing people together and helping create new networks and partnerships. Leaving just 12 months between the third and the fourth academies was done deliberately so as to ensure maximum levels of collaboration and so produce the strongest possible outcomes. Besides work on scientific papers, this time around the emphasis was on transforming ideas into action points, with a specific aim of translating pioneering research and thinking into relevant and tangible outputs that participants can take to COP22 (22nd meeting of the Conference of the Parties), due to be held in Marrakech in November. “What makes the Resilience Academy so special – and so useful – is that we meet for a full week, not just one or two days. Added to this, the same group met just 12 month ago, meaning we are already acquainted and have spent the past year working together, exchanging ideas,” explains Christopher J. Carter, a strategic planner at Eco Plan International in Canada, whose work is currently focused on flood risks. Looking forward to the Loss and Damage debate that will have a central place in the COP22 talks, the Resilience Academy 2016 participants were tasked with producing messages and findings on loss and damage that could be understood, and potentially acted on, by all relevant stakeholders, including scientists, practitioners, community leaders and world governments. During one afternoon of the Academy, Thomas Loster, Executive Board Member of the Munich Climate Insurance Initiative (MCII) and Saleemul Huq, the Director of the International Centre for Climate Change and Development (ICCCAD) hosted a mini-workshop entitled ‘How to Prepare an Effective Policy Brief’. Here, participants were invited to review examples of effective and ineffective communications, ultimately helping them learn how to best tailor their own research message so as to ensure it is picked up by policymakers. Notably, one of the most significant outcomes of the whole academy was the successful drafting of a policy brief for COP22. “As well as bring together leading experts in their respective fields, the Resilience Academy allows those individuals generating ideas to connect with those people who are knowledgeable in the policy process. This gives researchers real avenues through which they can get their message across to climate change negotiators,” explains Dr. Kees van der Geest, senior researcher at UNU-EHS. Keynote speeches were given by Terry Cannon from the Institute of Development Studies and Dr. Koko Warner, formerly of UNU-EHS and now with the UNFCCC (United Nations Framework Convention on Climate Change). A leading expert in his field, Canon focused on debunking three myths of disaster risk reduction, urging participants to reassess their approach to the topic, and this was followed up on Thursday by a mini writing workshop in which researchers were adapt their writing with the reader in mind to ensure that their takeaway message is always as clear and succinct as possible. “I feel we have made a real breakthrough here in how livelihood resilience can play a role in minimizing loss and damage in the event of a natural disaster. There’s been a long tradition of studying ecosystems resilience, but now we are starting to put people at the centre of our thinking,” Dr. van der Geest concluded at the end of the week. For the next two weeks, the participants of the 2016 Resilience Academy will continue to work together to finalise the key messages and findings they will send to COP22 negotiators with the aim of influencing the outcome of the Morocco talks. In the course of 2017 it is expected that the first scientific journal articles resulting from the academy will be published.